Dimmer Switches: Are They More Efficient? Dimmer switches are most commonly known for their ability to create a variety of lighting atmospheres with the same bulbs; whether you’re hosting a low-lit dinner party for business associates, or need maximal brightness to clean the house, a simple adjustment of the dimmer switch can do the trick. But when it comes to energy efficiency, does it really save money when the lights are low? 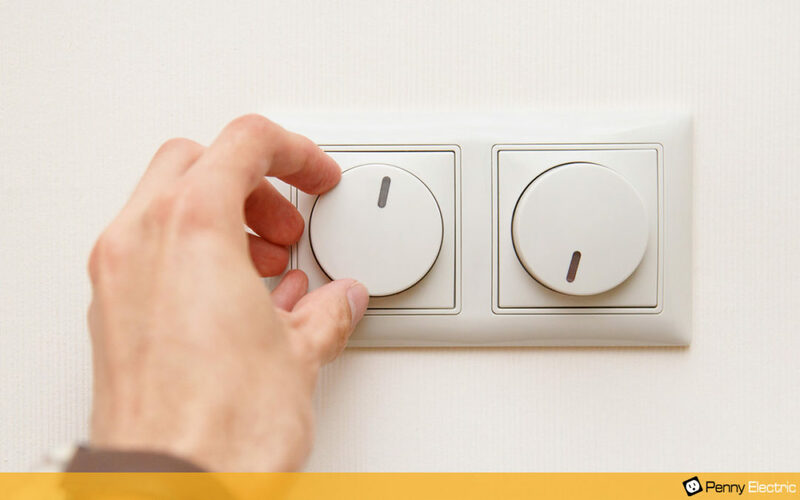 Here we explore some of the details on how dimmers factor into energy usage, and we’ll also discuss the pros and cons of dimmable switches. When dimmable switches first came on the market they were designed to dim lights solely for the visual appeal; in other words, the thought of energy consumption was not a high priority. In fact, the dimmed bulbs used just as much electricity as those which were fully illuminated; as the electricity that would have been used for light was simply turned into heat. However, as time went on more efficient designs allowed dimmer switches to monitor how much electricity was entering the bulb, and this has become even more perfected in modern lighting units. Today, modern dimmable switches can make a significant difference in your energy bill, simply by decreasing the amount of electricity that flows through your lights. What Are the Best Bulbs? When it comes to light bulbs, it is very important to not only know which types are efficient, but also which types are safe when used with dimmable switches. Whether CFLs, Halogens, or LEDs, bulbs that are not designed to be dimmed can create problems ranging from shortened bulb life, to potential electrical fires; that said, dimmable CFLs or LEDs are typically the best choice for both function and efficiency. At Penny Electric, we recommend LEDs because produce the least amount of heat while emitting quality light that retains a stable color even when dimmed, thus making it a favorite choice; they also rank among the most energy efficient bulbs available. One minor but potential problem with LEDs however is the presence of a TRIAC semiconductor in your home. TRIACs are devices that create a pulse of electric current rather than a steady flow; this was a method of reducing energy usage, and it works well with incandescent lighting, but it can be damaging to LED bulbs due to the way they utilize electricity. There are a few LED drivers that are designed to function compatably with TRIAC semiconductors available through various manufacturers. In conclusion, properly installed modern dimmer switches and the appropriate bulbs can make a big difference in your home or business by creating added aesthetic appeal, and also by cutting your spending every month; very few of our clients ever go back to a regular light switch once they’ve experienced the many benefits of a dimmer. Are you ready to make a difference in your energy bill? Penny Electric is ready to help you make the best choices in dimmer switch installation, and we can answer all your lighting and electric questions with the professional and friendly service that we’re famous for; contact us today for a quote on your project!